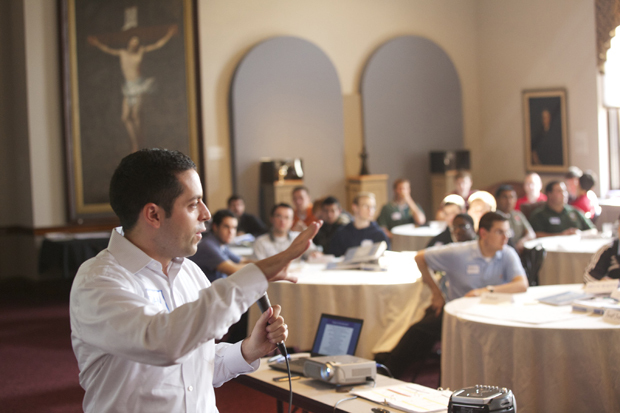 Daniel Cellucci of Catholic Leadership Institute conducts a leadership training seminar at St. Charles Borromeo Seminary in Wynnewood last September. The seminary received another grant to offer the training again this fall. Seminarians at St. Charles Borromeo Seminary in Wynnewood will reap the benefits of much-needed technology improvements and leadership training as a result of two recent grants from the Archdiocesan Educational Fund. The fund, which supports Catholic education in the Archdiocese of Philadelphia, was established in 1967 by Matthew H. McCloskey Jr., a trustee of the seminary. The Teaching for Preaching grant of $97,000 will provide 110 iPads to seminarians in the theology division and 30 iPads for faculty members. In addition, wireless technology will be installed in the student residences of St. John Vianney Hall on the seminary’s upper side campus. The seminary is overdue for the technology improvements, an official said. In addition, the faculty members will be trained on how to teach with the iPads in the classroom. Kokolus said the iPads will have research materials loaded on them along with apps for the Bible, the Divine Office and other spiritual content. Last fall, the John Cardinal Foley Chair of Homiletics and Social Communications was created at the seminary to focus on “promoting the work of priestly formation, ecclesial participation and professional dialogue in the realm of mass media and social communications.” Oblate Father Thomas Dailey is serving in this inaugural faculty position. Kokolus said the timing of the grant is perfect because of the focus on social communications and using the media to spread the Gospel. “I think this will open up whole new avenues for us,” she added. 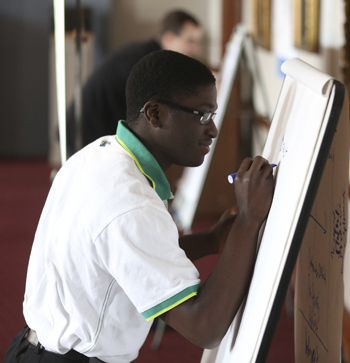 George Paul F. Mendy of the Diocese of Harrisburg and a Second College seminarian at St. Charles Borromeo Seminary, participates in the Good Leaders, Good Shepherds program at the seminary last fall. The second grant is a $50,000 challenge grant to provide seminarians with components of the Good Leaders, Good Shepherds Training Program of Catholic Leadership Institute (CLI). Seminarians in the theology and college divisions received a modified version of the Good Leaders, Good Shepherds training during the current academic year with CLI covering the cost. Next year the grant will help the seminary offer Module II of the program for all students in pre-theology and theology next year who had Module I in September 2013, and Module I for all the new men entering St. Charles this fall. Matthew Manion, president and CEO of Wayne-based Catholic Leadership Institute, said the training gives seminarians a better understanding of themselves, their strengths, their talents and leadership style, and how they can lead more effectively. He added that the seminarians gain immediate benefits of the training. “While they’re still preparing, we’re giving them skills to better lead themselves and to have better interpersonal relationships as seminarians,” Manion said. He added that this leadership training is critical, especially with fewer priests in parishes. The seminary will be working with CLI to raise the $50,000 in order to receive this match from the Archdiocesan Educational Fund. “I’m confident that some of the donors (through CLI) who supported us last year will support us again,” Bishop Senior said. He also noted that a recent golf outing raised approximately $25,000, which will help reach the fundraising goal. Bishop Senior acknowledged the impact the McCloskey family has had in Catholic education in the Archdiocese.